Youth workers and police officers will target and prevent youth offending in Melbourne’s north-west and south as part of a 12-month pilot program funded by the Andrews Labor Government. The Andrews Labor Government is celebrating the outstanding volunteer efforts of Nika Suwarsih from Dandenong, who is among the nearly 60 incredible Victorians shortlisted for the 2018 Premier’s Volunteer Champion Awards. 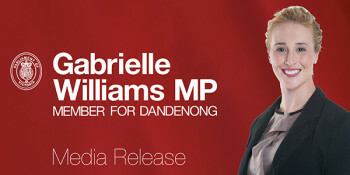 Member for Dandenong, Gabrielle Williams, today welcomed Victorian Premier Daniel Andrews’ announcement that Free TAFE would be available for 10 additional non-apprenticeship courses in areas ranging from community services to construction and cyber security, as well as two additional pre-apprenticeship courses. A copper electrical cable manufacturer in Melbourne’s South East will boost its energy efficiency, increase production capacity and retain jobs, thanks to support from the Andrews Labor Government. Residents of Dandenong can now vote for their favourite local projects with 243 ideas across the Southern Region. The Andrews Labor Government is working to create jobs in Dandenong, with a $165,000 grant to kick-start planning for the Dandenong National Employment and Innovation Cluster. Dandenong’s temporary Pop-Up Park has found a permanent home thanks to funding from the Andrews Labor Government. Young people in Greater Dandenong are getting a helping hand to build their confidence and explore creative careers thanks to funding from the Andrews Labor Government. Rough sleepers across Victoria will have greater access to support services with tenders now open to establish assertive outreach teams in ares of high need across the State. St Mary's Cricket Club Dandenong will be better prepared to manage a medical emergency on and off the park after receiving a defibrillator and training package from the Andrews Labor Government. Rough sleepers in regional and outer metro areas will have better access to housing and support services with modular homes planned for three new sites across Victoria. Students and teachers at Dandenong Primary School are set to turn learning into an artform thanks to a $35,000 grant through the Victorian Government’s new Creative Learning Partnerships program. Ambulances are responding faster to life-threatening emergencies in the City of Greater Dandenong, while elective surgery waiting lists are at record lows. The Andrews Labor Government is supporting the commercial and industrial sector to develop innovative solutions to avoid, reduce and reuse food and plastic waste. Dandenong Primary School will soon receive an important refurbishment to help protect the school’s external areas, thanks to the Andrews Labor Government.